As the English football season has just begun, I thought I would have a look to see what we have in the collections that was football related. When you have a collection of over 6.5 million images it's hard to keep track of what's actually in the archive. With the old EAP online platform, it would have been quite a frustrating experience. You would have had to search the Library’s Archives and Manuscripts catalogue first and then try to find the relevant image on our website, sometimes having to scroll through hundreds of other images first before finding the desired one. With the ability to now search directly from our website, you can easily find related images, however it does highlight the need for good quality metadata. These images are only discoverable if someone has been able to describe them properly, adding keywords and other relevant information that researchers may look for. With this in mind, I searched for football, soccer, futbol etc., and was pleasantly surprised to find many great photographs I thought were worth sharing. Most of the images come from the Haynes Publishing Company Archive in Argentina, with others from Bulgaria, Cameroon, Guatemala, India, and Mali, truly showing the global appeal of the sport. The Argentinian ones in particular are quite spectacular and give an idea of the popularity of the game in the country! There are images of spectators crammed into stadiums, and others show fans being dangerously hoisted up the outer wall of the stadium in a desperate attempt to watch the game. As always, follow the links to see the full size versions and discover what else is in the archive. EAP449/2/22 - Photographic Archives of Abdourahmane Sakaly. Mali. Our last blog of the year has been written by Rossitza Atanassova, Digital Curator at the British Library. I can’t think of a lovelier way to finish the year than have a colleague and friend reminisce about her childhood using images from EAP103 held at The Ethnographic Institute and Museum, Bulgarian Academy of Science, Sofia. 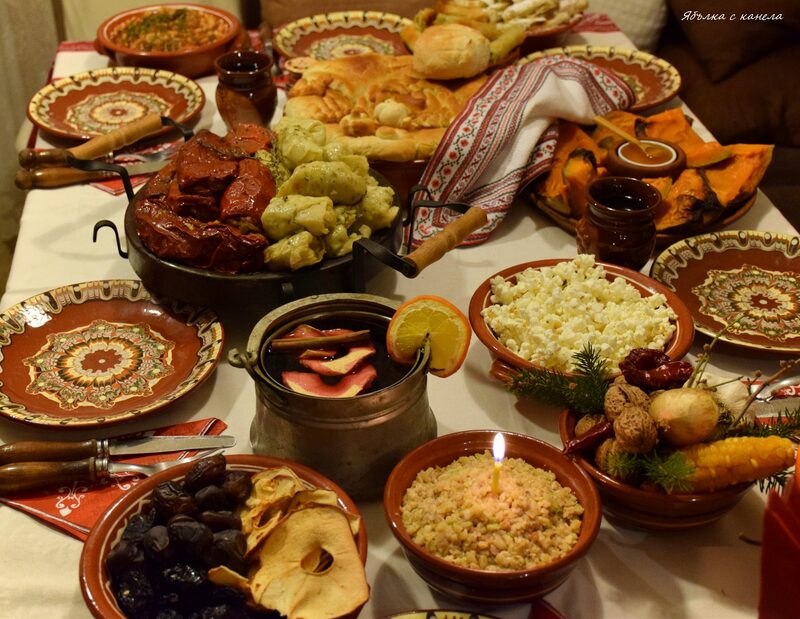 Gathering the whole family at Christmas Eve to share this simple symbolic meal is one of the most intimate and honoured Bulgarian traditions. At the start of the meal the eldest member of the family would light incense and pass it round the room and over the meal as a sign of protection from misfortune for the household. It falls on the eldest man in the family to bless and break the ritual bread, saving the first piece for the Virgin Mary and distributing a piece each to all members of the family. The early 20th century photograph (below) of a family from the village of Petrich near Sofia captures the moment of kissing the ritual bread as it is held out by the elder in the family. The symbolism of the bread in this ceremony is captured so well by the photographer, as it occupies a central place in the image with all three generations of the family showing such reverence and hopefulness as they huddle around it. There is so much intimacy and spontaneity in the photograph, with the grandfather staring solemnly at the camera, his son or son-in-law enjoying a glass of home-produced rakija and the younger children looking furtively around. I have such fond childhood memories of the Christmas Eve preparations at home when I helped my mother and grandmother to knead the ritual bread and decorate it with the Nativity scene and the sign of the Cross. It is a tradition I have passed on to my children and year on year they are excited about making together the ritual Christmas bread. There is a great regional variety in the shapes and decorations, many of which reference agricultural activities such as ploughing, shepherding and winemaking, as well as Christian symbolism. Some examples of ritual breads can be seen in the EAP103 archive, and the Ethnographic Museum has an important collection of stamps used for decorating ritual breads, such as this Nativity Scene stamp. It is traditional to hide a coin in the Christmas bread and whoever finds it is said to have all the happiness and success in the New Year. On Christmas Eve, groups of boys and young men (koledari) visit the houses in their neighbourhoods and villages, singing auspicious verses about prosperity and well-being. These welcome guests exchange traditional greetings with the families and give their blessings to every member of the household. In return the Koledari receive gifts of food and ritual ring-shaped breads, often made by the young women in the family, which they string on the wooden sticks they carry. On New Year’s Day it is customary for children in Bulgaria to carry tree branches (survachka), traditionally decorated with dried fruit, popcorn, breads and wool, and to recite blessings for family and friends in exchange for a coin or other gifts. As a child I loved the festive atmosphere in Sofia with stalls selling survachki decorated in red and white paper. This custom continues the joyful and hopeful Bulgarian Christmas celebrations and tradition which the photographic archive gives us such wonderful glimpses of. The EAP team would like to wish everyone a Merry Christmas and the very best for 2018. Over the past month we have made four new projects available to view through our website. We have also added two new projects to BL Sounds. There are now eight EAP funded projects on Sounds in total, with over 25,000 tracks to listen to. This includes a wide variety of genres of music from Micronesia (EAP115) and Guinea ( EAP187, EAP327, EAP608); folk and traditional songs and talks from the Uralic speaking regions of Russia (EAP347); Indian classical music (EAP190; EAP468); and musical pieces and poetry from Iran (EAP088). This project aimed to secure and digitise two collections of Ethiopian manuscripts kept in remote monasteries located in the Shire region of the Province of Tigray: Marawe Krestos and Däbrä Abbay. These manuscripts are crucial for the study of Ethiopian and Eastern Christian monasticism and the history of Ethiopia, particularly for the northern regions which are now a part of Eritrea and difficult for researchers to access. They also document the history of the Ethiopian Tewahedo Church and bring to light the new and little known works of Christian and Ethiopian Church literature. The digitised material is a great resource for researchers studying the history of manuscript and Ethiopian art history in the context of Christian, Oriental and Byzantine artistic traditions. The project was able to fully digitise the two collections. 61 manuscripts were digitised from Marawe Krestos and a further 45 belonging to Däbrä Abbay. A total of 14,602 folios, covers and edges were digitised. The material dates from the 14th century to the 20th century. The EAP115 project aimed to collect and digitise music and recorded chants from around the Micronesia region. It achieved this by gathering music from government radio stations in Majuro, Marshall Islands; Kosrae, Pohnpei, Chuuk and Yap, Federated States of Micronesia; and Koror, Palau, as well as from private collections and church sources in Chuuk, including the Liebenzell Mission and the Catholic Church media studio. The collection features a wide variety of musical styles and charts the evolution of music in the region, with recordings ranging from religious chants and choirs, to more modern rock and reggae songs. All 7069 recordings are available to listen to freely from around the world on BL Sounds. So far the most shared track is the aptly named ‘A happy celebration song’, performed by girls from Woleai, Yap State. You can listen to the track here and explore from there. Portuguese rule in Goa bequeathed a vibrant Catholic community and a rich legacy of texts in Portuguese and Indian vernacular languages. These texts are held in a number of different State, Church, private institutional and family collections and have often been forgotten or lost in collections with no catalogues, remaining invisible to scholars and those interested in the history of Christianity in the area. Many of these texts, dating back to the sixteenth century, were in danger of being lost altogether due to uncertain archival conditions and poor preservation. The aim of this project therefore was to locate, identify and digitise many of these Christian manuscripts located in the region of Konkan. By creating a centralised digital archive of these texts the project has been able to provide a significant resource for scholars and community members interested in the history of Goa, particularly its Catholic communities. The project was able to digitise the collections of several local families as well as those of institutions in the region. This included digitisation of the manuscript collection, as well as significant books, from the Seminary of the Missionaries of St. Francis Xavier in Pilar, relating to the order and to the Church in Goa. The Jesuit-run Thomas Stephens Konknni Kendr (TSKK) research, educational and cultural centre also agreed to let its collection of manuscripts be digitised. This included its collection of microfilms of early Marāṭhi and Kōṅkaṇī manuscripts. EAP675/23/1: "Turks in Kardzhali region, South Bulgaria. Akhmed Yusmenov collection [1950s-1980s]"
This project was focused on the discovery, analysis and digitisation of 20th century photographs depicting elements of Bulgarian minorities’ culture. The project was targeted at different ethnic and religious communities, such as Old Believers, Turks, Armenians, Karakachans, and Vlachs. This major project continued the work carried out in the earlier EAP500 pilot project, which focused mainly on a few small collections of Pomaks, Turkish, Karakchan and Tatar images. Documentary material from minority groups in Bulgaria is scantily represented or missing from Bulgarian archives. The reason for this is rooted mostly in the mono-centred state policy, focused for a long period solely on the Bulgarian ethnic tradition and culture, as well as in the policy of the Bulgarian state before 1989 aimed at forced assimilation of minorities. This is the reason for the gradual disappearance or even purposeful destruction of pictures and photographic collections of the different minorities in the country, particularly of the Muslim minority during the so called “Revival process” in Bulgaria in the 1960s-1980s. The policy of the Bulgarian state for a forced assimilation of the Muslims was accompanied with the destruction of all documents – official, personal and family – that were testament to their minority identity. Through the research carried out both in this project and EAP500, it has been found that such documents had often been hidden and saved, although often in inappropriate conditions. The project succeeded in discovering and safeguarding these images, and helped create an understanding amongst these groups as to the importance of the project and the need for preservation of these endangered archival documents. Since completion of the project the team has continued to be notified of newly discovered material with families opening up their own collections for study and digitisation. This project set out to create an inventory of 6000 primarily Sanskrit, Prakrit and Bengali manuscripts held in the Rāmamālā Trust compound in Comilla, Bangladesh, and to digitise a sample of them. Established in 1935 by Maheśacandra Bhaṭṭācārya and currently run by the Mahesh Charitable Trust, the collection was meant to promote education and preserve Bengali culture. It was also intended as a resource for preserving and promoting Hinduism within a dominant Muslim environment on the eve of British colonialism. Much of the library is thus dedicated to Sanskrit scientific and legal literature. Yet it also contains unique texts in a variety of other Sanskrit genres and includes many regional works in Bengali (eg, a rare version of the Mahābhārata), together with some works in Prakrit. Consequently, it preserves a snapshot of the literary and religious culture of the region in pre-colonial and colonial times, encompassing not just Hindu works but also works related to a distinctive, regional variety of Islam (Satyapīr). The collection has been physically displaced twice. First during the upheavals in 1947 when India and Pakistan were partitioned, and then again in 1971 when Bangladesh broke away from Pakistan. Early attempts to itemise, catalogue, and identify manuscripts have been largely lost; all that remains by means of a catalogue is a general overview of the collection and archives of a few handwritten notes. The manuscripts themselves suffer from physical neglect and dilapidation. They are housed in rooms with glassless windows and leaky roofs, exposed to the elements, and open to vermin and potential theft. Since Bangladeshi independence, there have been limited efforts to ameliorate the disarray of manuscripts, including some microfilming in the 1980s, and classification of the manuscripts’ general categories. Despite the promise of these preliminary efforts, the full scope of the collection remained unknown. The project found that there were far more manuscripts in the collection than initially thought, with an estimated 9000 in total. This discovery added a significant strain on resources for creating the inventory and managing their assessment, however, the team were able to complete their work, converting handwritten lists into spreadsheets, and make the inventory readily available to scholars worldwide. The project was also able to digitise a sample of 85 manuscripts ranging from 1 folio up to 620 folios in length dating from the mid-17th century up until the early 20th century. The project also carried out preservation work on many of the endangered manuscripts and moved them to less exposed locations away from vermin and water leaks. New online collections – September 2014 – three million images online!